Craft beer is the perfect accompaniment while you're taking in the sun and tunes floating down the river this summer. Wondering if you should choose a helles or hefeweizen? Here is a breakdown of some of the most popular styles of beer for the summer. • American lager: Pale in color, light in body and low in bitterness, the big boys in brewing are American lagers — think Budweiser, Busch and Pabst Blue Ribbon. • Pilsner: Clear with a light straw color, this style of beer was developed in the western part of the Czech Republic. Smooth and crisp, pilsners also tend to carry a spicy bitterness from the hops. • Pale ale: A popular style, pale ales usually incorporate more local ingredients, which can account for a wide variation in products. American pale ales tend to be clean and hoppy, without being overly bitter. British pale ales tend to be maltier in taste. • India pale ale (IPA): Credited with helping to drive the craft beer movement in the United States, IPAs can be extremely varied, depending on the brewery. However, most contain a high hop profile, which can range from a citrus finish to extremely bitter. These beers also tend to have a higher alcohol by volume (ABV). • Kolsch: A German-style of ale, Kolsches are a bit more obscure but have become popular brews in the summer due to their lighter body. Pale in color, but with a drier finish and somewhat assertive hop flavor, this style is gaining traction. • Hefeweizen: Another German-style beer, hefeweizens are made primarily from wheat and have a cloudy appearance. Usually spicy with notes of banana and clove and very little hoppiness, hefeweizen is a popular summertime style. • Witbier: A Belgian version of a wheat beer, witbiers are cloudy in appearance and are always spiced; coriander and orange peel often make an appearance. They’re crisp and refreshing. • Helles: German for “bright,” this lager has the spicy hop characteristics of a pilsner but is a bit maltier, making for a more balanced beer. It’s usually lower in ABV, which makes it a great choice for summer. ah, summer in the High Country. It’s a magical time, a period of long-stretching sunlight in which to enjoy a wide variety of activities and fill up your Instagram feed. From barbecuing with friends and family to hiking, biking, rafting, climbing, golfing, camping or whatever else you wish, one question should be top of mind, wherever your plans take you: What are you going to drink? Hydration is key during these warm summer weekends, and while there are plenty of nutritious beverages that should be enjoyed (like water, for instance), beer is the champion’s choice. Not only is it delicious, it’s also versatile, providing a refreshing option for almost any activity. But what beer should you drink? From IPAs to hefeweizens to kolsch to sours, the choices are almost as daunting as the blue mountains that appear on an icy can of Coors Light. However, we consulted some of the area’s experts to help suggest what to drink over these long, fun-filled days of summer — and when to drink it. This should go without saying, but please enjoy these beverages responsibly whenever you pop a top. Recommended by: Ben Nadeau, head brewer at Crazy Mountain Brewing Co. Description: Citrusy (from the Amarillo, Cascade, Simcoe and Centennial hops), balanced by a malty background. The addition of grapefruit gives this beer a very palatable, bittersweet finish, Nadeau said. Caution: This is a big beer, weighing in at 9 percent alcohol by volume (ABV). Do not attempt to drink these all day long. Description: Many different flavors and aromas come to the scene, from citrus and tropical to piney and floral, Nadeau said. 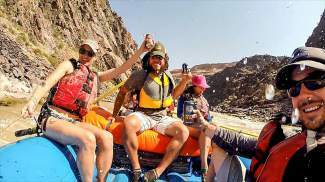 Perfect for: Drinking immediately after cruising down singletrack or taking in the sun and tunes floating down the Colorado River. Recommended by: Garrett Scahill, head brewer and co-owner of Vail Brewing Co. Description: A 6.2 percent ABV American pale ale, this beer is mildly bitter with refreshing notes of citrus, pine and grapefruit, Scahill said. ’Merica Pale Ale is making its bottle debut and will also be available on draft at the Vail Brewing Co. taproom. Bonus: It’s named ’Merica. Showing your patriotic spirit is not just for the Fourth of July — bust out your jorts and trucker hats whenever you swig this beer. Description: Light-bodied, Kolsch-style ale, with fresh lemon zest and fresh mint. Perfect for: Floating down a river. “It’s deliberately designed to be that beer you search for in the bottom of the cooler as the sun beats down on you after a day on the river,” Jessen said. Description: Unfiltered, well-balanced, complex pale ale that is bold, juicy and tropically hop forward. Perfect for: You heard the man: floating a river, golfing or enjoying time with friends. Description: Hoppy Valley IPA’s boldness is tamed with a slight taste of grapefruit, making it easy to drink and refreshing. “This IPA has the hops and boldness that IPA lovers want in a beer but is mellowed out with the refreshing hint of grapefruit, making it a crowd pleaser for anyone,” Wood said. Perfect for: Barbecuing with friends. Description: With a big piney, citrusy and tropical nose, it has enough malt to keep it balanced and a perfect amount of bitterness. Incredible Pedal finishes with a mountainous amount of grapefruit and tangerine. Perfect for: Rock climbing (afterwards, not during; you need two hands for this sport). Description: Blonde-colored session ale with a nice touch of citrus hop character. “It’s light, easy drinking on a hot day and low enough in alcohol that you can enjoy it all day without going overboard,” Austin said. Perfect for: Anything in the sunshine. Description: Slightly tart, yet still carrying the spice of a traditional wit bier, Liliko’i is a great beer for someone who’s looking for a something a little different, while retaining a lighter, refreshing finish. Perfect for: Rehydrating after a hike in an unexpected rain shower. This beer will make it all better. If you’re feeling thirsty this summer, this list should provide some tasty options for sampling after a wide variety of activities. But no matter what you choose to drink, just enjoy soaking up the summer. After all, it goes by so quickly.